The use of randomly distributed fiber as soil reinforcement is nowadays a popular ground improvement technique. The absence of weak plane is a major advantage of the fiber reinforcement over the other soil reinforcement techniques, where weak plane exit parallel to the reinforcement. Similar to the roots of plant, fiber binds soil particles through surface interaction between soil and fiber, which results in the improvement of the load carrying capacity of soil. 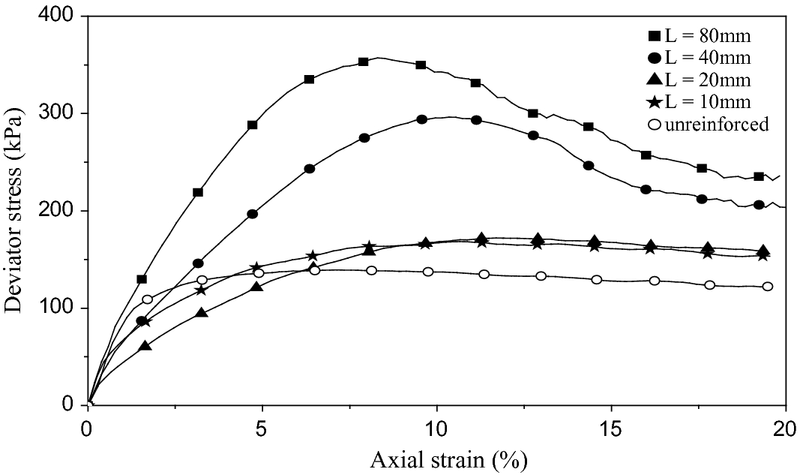 In this study, a series of triaxial test were carried out to understand the effect of confining pressure on the strength and stiffness characteristics of the fiber-reinforced soil. The test results have shown that with increase in the confining pressure, peak stress and stiffness increases. But the performance of fiber reinforcement in strength improvement is more significant in case of lower confining pressure, because the reinforcing action of the fibers was suppressed by the increased confining pressure. Due to ease of construction, the overall economy and simplicity of construction, soil reinforcement is most popular ground improvement technique. The availability of different materials and techniques as options is also a major advantage of the soil reinforcement. The use of reinforcements in the form of rod, sheets, membrane, etc., is traditional way, while randomly distributed fiber is one of the new technique. Fiber has been used for a long time, but the utilization of these materials in construction is not frequent because of less understanding of potential of the fiber reinforcement. In fiber reinforcement technique, fiber is randomly mixed in the soil due to which isotropy can be achieved. The absence of weak plane in fiber–soil mixture is a major advantage of fiber reinforcement (Maher and Gray 1990). Generally, such plane exists parallel to the soil reinforcement interface in case of plane reinforcement. Mechanism of the fiber-reinforced soil is based upon the interaction between soil particles and fiber. The resistance provided by the fibers due to surface friction and interlock leads to the load carrying capacity of the soil (Tang et al. 2007). The behavior of fiber reinforcement is investigated by different case studies, model tests, and other laboratories tests. 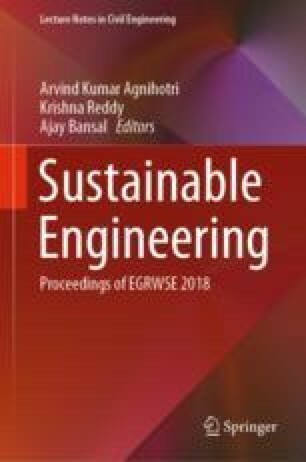 Different researchers through case studies like on embankment by Gregory and Chill (1998), on landfill liners by Refai (2000), on roads by Lindh and Erriksson (1990) and Santoni et al. (2001), etc. have shown the beneficial utilization of fiber reinforcement in different application. Gregory (2006) has suggested that fiber can be used effectively as secondary reinforcement in soil, with planar geogrid as main reinforcement. Through model test on strip footing supported by fiber-reinforced soil, improvement in the bearing capacity, and stiffness have reported by Al-Refai (1992) and Wasti and Butun (1996). 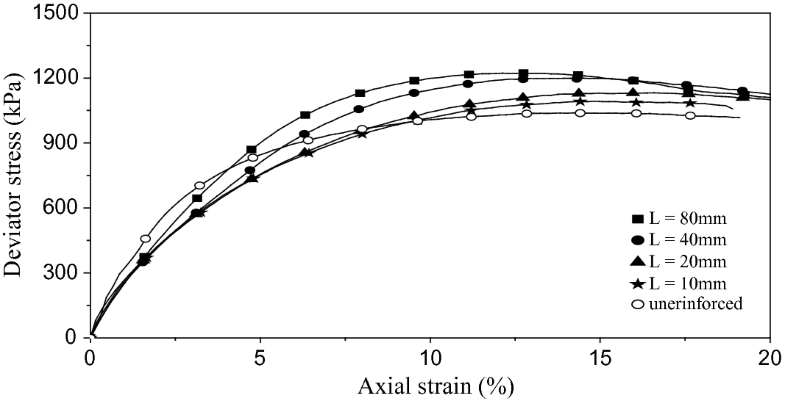 Stress–strain responses of the fiber-reinforced soil have been studied by different researchers. Gray and Ohashi (1983) have performed direct shear test on oriented fiber and found that strength improvement due to fiber-reinforced soil is proportional to the area ratio of fiber, stiffness of fibe,r and orientation of fiber. Gray and Al-Refai (1986), Maher and Gray (1990), Al-Refai (1991), Michalowski and Zhao (1996), Ranjan et al. (1994), Michalowski and Cermak (2003) through triaxial test have shown that performance of fiber reinforcement depends upon the fiber properties like length of the fiber, fiber content, stiffness of fiber and surface properties of soil and soil properties like soil type, size of particles, etc. Babu and Vasudevan (2008) have reported that increase in the diameter of fiber also improves the strength of fiber-reinforced soil. Ranjan et al. (1994), Santoni et al. (2001) have shown through the study that with increase in the length of fiber and fiber content strength of the fiber-reinforced soil increases up to a certain limit, but further increase in length and content of fiber does not contribute in strength improvement. 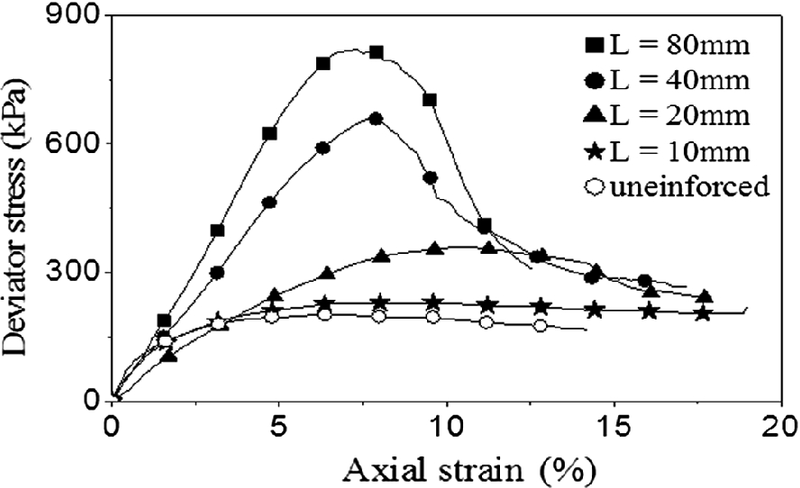 In the present study effect of confining pressure on the different properties of soil like stress–strain properties, strength properties, stiffness properties, and deformation properties have been studied through a series of triaxial test, the details of which are presented below. The soil used in this study was locally available sand. The properties of the soil are presented in Table 1. According to the Unified Soil Classification System (USCS), the soil is classified as poorly graded (SP). Glass fiber is used for reinforcement purpose in this study. Glass fibers were obtained from the local market and cut into different required length. The properties of glass fiber used in this study are presented in Table 2. In this study, triaxial tests were conducted on the unreinforced and fiber-reinforced soil specimen having a height of 200 mm and diameter of 100 mm. The tests on unreinforced soil specimens were also conducted to understand the beneficial effect of the reinforcement. For the study of the effect of confining pressure on the behavior of fiber-reinforced soil, relative density of soil, length of the fiber, and fiber content are taken as variable parameters. Two different relative densities (Dr) 30 and 80% which represent loose and dense condition, four lengths of fiber length (L) 10, 20, 40, and 80 mm, and fiber contents (fc) of 1, 2, 3, 4, and 5% are used for the tests. All the tests were conducted on four different confining pressures (σ3) 49, 98, 196, and 392 kPa. Strain-controlled triaxial test setup was used with a strain rate of 1.25 mm/min during the experiments. To prepare the unreinforced soil sample, the required weight of soil was taken to maintain the particular relative density, and then it was poured in sampler and compacted in layers. In case of fiber-reinforced soil first mixture of soil–fiber was prepared. For this purpose fiber was taken as percent weight of soil mass. Fiber content (fc) here is defined as the ratio of weight of fiber (wf) to the weight of soil mass (ws). To maintain the particular density required, the weight of soil and fiber was taken by assuming soil and fiber both as a part of solid part of soil. Mixing was done by hand mixing to achieve uniformity. Hand mixing is preferred by different researchers like Maher and Gray (1990), Al-Refai (1991). To avoid the segregation of fiber from soil, 3% of water was used to mixed soil and fiber. It was found that such amount of water does not affect the strength and stiffness of sand (Maher and gray 1990; Al-Refai 1991). After preparation of soil–fiber mixture, it was poured in the cylindrical sampler and compacted in layers to prepare soil sample. The test results are presented here to understand the effect of confining pressure on the strength of the soil, stiffness of the soil and on the shear strength parameters. Careful observation of the soil specimen after the test was also done to understand the deformation behavior of the fiber-reinforced soil. 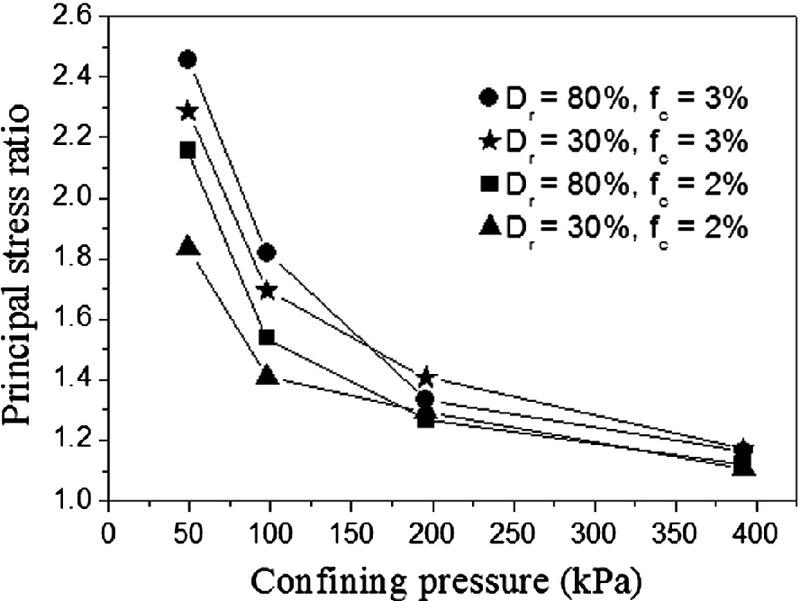 Figures 1 and 2 represents the stress–strain behavior of fiber-reinforced soil for different lengths of fiber at low confining pressure (49 kPa) and high confining pressure (98 kPa) relatively, for the soil specimen with relative density of 80%, and fiber content of 4%. In the case of low confining pressure (49 kPa), stress–stain behavior of fiber-reinforced soil (Fig. 1) is showing stress drop after peak stress, which is similar to strain softening behavior. Stress drop is more in case of longer fiber, while in case of short fiber the behavior of fiber-reinforced soil is similar to the unreinforced sand, where stress drop is less. But in the case of high confining pressure (392 kPa), the soil is showing strain hardening behavior (Fig. 2) where material deforms at an approximately constant deviator stress after reaching the peak. Stress–strain behavior for all sizes of fiber is approaching toward asymptotic state. It can also be noted that improvement due to fiber reinforcement with respect to unreinforced soil is more in the case of low confining pressure. For example in case of fiber length of 40 mm improvement in peak stress is three times with respect to unreinforced soil at confining pressure of 49 kPa (Fig. 1), but in the case of high confining pressure of 392 kPa (Fig. 2), the improvement in the peak stress for fiber-reinforced soil is around 1.5 times of peak stress of unreinforced soil. It indicates that due to the increase in the confining pressure, reinforcing the action of fiber has suppressed. A similar type of behavior is found for the loose soil (Figs. 3 and 4). Principal stress ratio is the ratio of maximum principal stress (σ1) of reinforced soil to the unreinforced soil at failure. Figure 5 shows the variation of principal stress ratio with confining pressure. It can be observed that at lower confining pressure, principal stress has higher value, while with increase in the confining pressure, it is decreasing. This behavior is similar for both loose (Dr = 30%) and dense soil (Dr = 80%). But in the case of dense soil, the principal stress ratio is higher than the loose soil. With increase in the relative density of soil, soil–fiber interaction increases. Increased interaction increases the strength improvement capacity of fiber reinforcement. 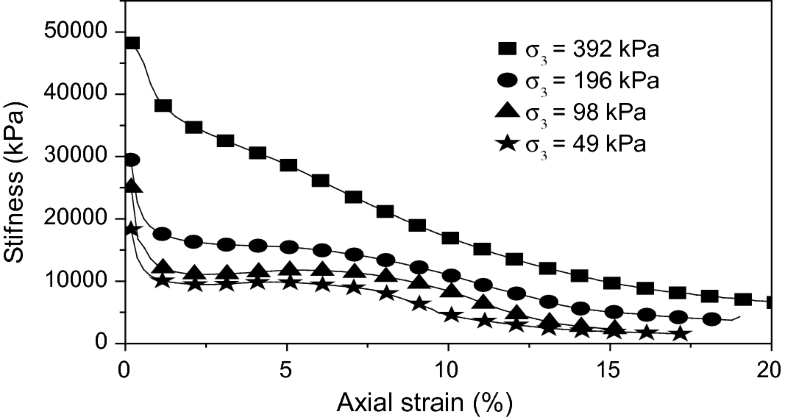 Figure 5 also shows the impact of confining pressure on the principal stress ratio for different fiber content. At lower confining pressure, the principal stress ratio is greater for higher fiber content. If the amount of fiber is increasing, then more fibers are available for the interaction with soil, which increase the load carrying capacity of fiber-reinforced soil. It can further be noted that at higher confining pressure, the principal stress ratio is almost the same, which indicates that with increase in confining pressure, the impact of fiber parameters does not take place effectively. To understand the effect of confining pressure on the stiffness of the fiber-reinforced soil, variation of stiffness modulus at particular strain for different confining pressures for dense sand (Dr = 80%) is presented in Fig. 6. Strain modulus at any strain is the ratio of deviator stress to the corresponding strain (Babu and Vasudevan 2008). It can be observed that for any strain, stiffness modulus is increasing with increase in the confining pressure. It can be further noted that at low strain stiffness, modulus is high and with increase in the strain, it is decreasing. The behavior of fiber-reinforced soil mainly depends upon the surface interaction of soil and fiber. With increase in the confining pressure, the frictional resistance between soil particles and fibers increases, and these increases in the frictional resistance directly resists the deformation in the soil. Due to this resistance at a particular strain, the load carrying capacity has increased and soil has shown higher stiffness. A similar type of behavior is found for loose soil also. Fiber reinforcements have the potential to increase the load carrying capacity of the soil. Confining pressure has a significant impact on the load carrying capacity of soil. Peak stress increases with increase in the confining pressure of soil. 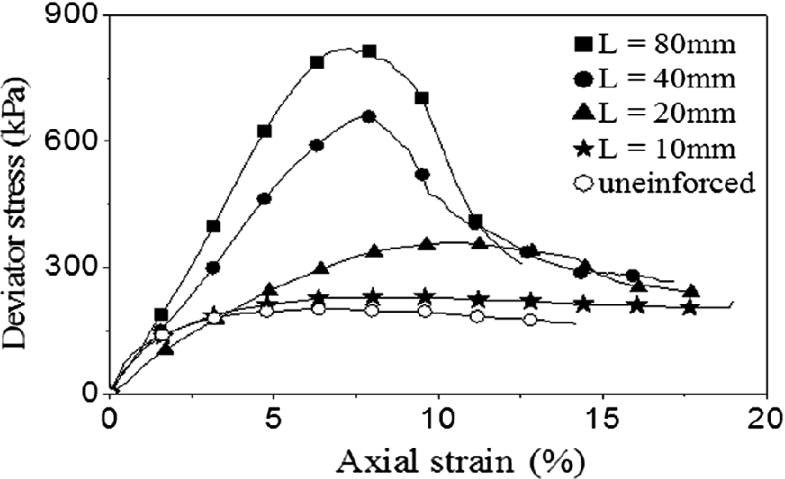 At low confining pressure, the stress–strain behavior of fiber-reinforced soil is similar to strain softening behavior, while at high confining, its behavior is strain hardening type. With increase in the confining pressure, stiffness modulus for fiber-reinforced soil at a particular strain increases.